This weekend was a first for me. 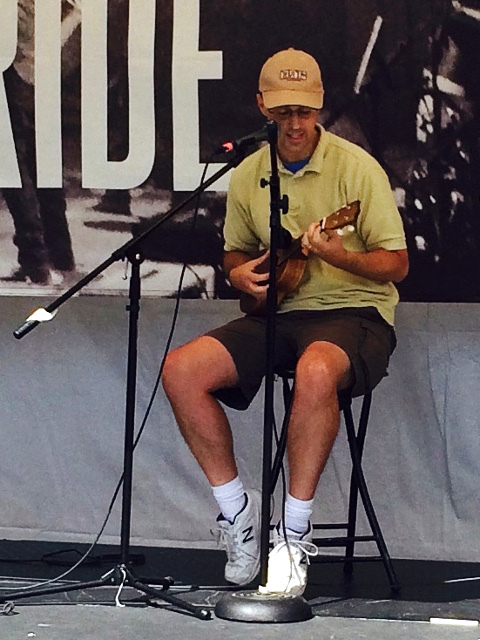 I performed a simple ukulele song on a stage with an audience. 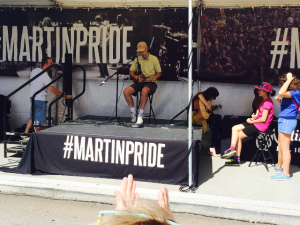 The song was “Princess Poopooly” and the venue was the C.F.Martin guitar company tent at the IBMA World of Bluegrass street festival. I’ll admit, “Princess Poopooly” is not a bluegrass song… it’s a silly Hawaiian tune. But the kind folks at the Martin tent invited any and all to come up on stage and show their stuff. Play a song, get a T-shirt. The performance itself was underwhelming. I’ve never worked with mics before, so it was a little constraining to sit behind two: one for me and one for my ukulele. Halfway through my song, the uke mic dropped out of the stand and into my lap, which led to the most-remembered line of my act: “whoops!” The kids laughed and repeated that one over and over. This was the realization of a promise I made to myself at last year’s World of Bluegrass festival. After watching a bunch of other folks step up and play (including both of my daughters), I decided that it was time to pick up an instrument myself and learn. Big thanks to the folks in the audience who cheered me on.